The doctors at Eye Physicians of Northampton specialize in treatment of keratoconus with specialized Rigid Gas Permiable contact lenses and corneal transplantation. 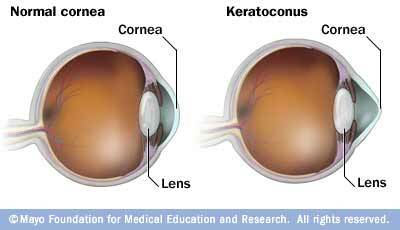 Keratoconus is an abnormal shape of the cornea. Keratoconus literally means cone-shaped cornea. Keratoconus is an uncommon eye condition where the normally round, oval-like cornea becomes thin and develops a cone-like bulge. The cornea is the clear, front part of the eye, that has a lot to do with how you see. As light enters the eye, the shape of the cornea direct the light rays so that they land in a particular fashion on the nerves in the back of the eye, called the retina. If the light rays are directed correctly, you can see clearly. When the cornea is affected by keratoconus, it expands outward and becomes extremely steep and almost pointed, thus changing the direction of light entering the eye. Images become blurry and distorted. Keratoconus can make many activities such as skiing, driving, typing on a computer and watching television, difficult without correction. Keratoconus is routinely problematic in both eyes, however; symptoms in each eye may differ. Keratoconus can affect persons of all ages but typically starts to develop by the mid – late teen years. The rate of keratoconus progression varies. It will often progress slowly for 10 to 20 years and then may suddenly stop. Use of specialized (RGP) Rigid Gas Permeable contact lenses can often help patients with certain degrees of keratoconus to regain the clarity of their vision and allow for them to return to normal visual function. Sometimes use of RGP lenses, due to the severity of the keratoconus, are not appropriate for restorative vision or do not provide good clarity or comfort to the patient. In these cases corneal transplantation may be an option. Only thorough evaluation with a corneal specialist will indicate which treatment is right for you. To schedule a consult with one of our ophthalmologists that specialize in corneal treatment, please contact the office.